The First World War has been commemorated on disc in a number of ways by a variety of labels but in my experience the most extensive, exploratory and intriguing work has been the multi-volume releases by Hortus. Steven Isserlis’s focused single disc works on two fronts; major sonatas composed during the war and an appendix of light pieces performed on a so-called ‘trench cello’ – which is more accurately, if perhaps more prosaically, described as a pre-war ‘holiday cello’. More of that later. This release can be seen in the context of BIS’s orchestral disc called In the Shadow of War (BIS-1992) in which Isserlis plays Schelomo and Bridge’s Oration. Isserlis is joined by Canadian pianist Connie Shih whose imaginative, never-subservient contribution is notable throughout. She shows that both instruments can be equal partners in the Debussy Sonata where so often the recorded balance and dynamics favour the string player. Her athleticism and dramatic interventions ensure the music-making remains vivid at all times. The second movement pizzicati are well-scaled, not outré or almost parodic as is sometimes the case these days. It was never a temptation for someone - Maurice Maréchal - who performed the sonata in the years immediately after the composer’s death and whose recording is still a beacon of sensibility and tonal beauty. Fortunately Isserlis and Shih are not self-indulgent when it comes to tempo or to expressive gesture; theirs is a taut, convincing reading. So too is the Bridge. Isserlis’s lyric expressivity is admirable, and he varies his tone colour, bow weight and phrasing with great sensitivity. The complex melancholy of the second of the two movements, notably its agitato moods, emerge all the better for this level of rhapsodic intensity, where fast vibrato speed and Shih’s urgent pianism generate the kind of ambiguity necessary for a truly successful performance. For a different look, try Paul Watkins and Ian Brown (Hyperion CDA68003), whose Nash Ensemble all-Bridge disc sounds heavier in tone, or Raphael and Peter Wallfisch (Chandos CHAN 8499, coupled with Delius, Walton and Bax) who are altogether brisker in the opening movement, giving it – and the sonata’s proportions - a somewhat different slant. Fauré’s D minor sonata was written in 1917 and is played with the kind of youthful litheness - though he was in his early 70s when he wrote it - that the work craves. The admixture of later prevailing harmonic clouds gives the sonata the grit necessary to stop it spilling over into effusiveness. Frédéric Lodéon with Jean-Philippe Collard and Paul Tortelier with Eric Heidsieck show the very divergent approaches this work can take – the former generous in the slow movement, the latter much more tensile. The shock of Webern’s epigrammatic pieces after the Fauré is substantial but seldom has more been packed into such haiku-like self-containment as here. It’s well-known that soldiers took instruments to the front with them. The appendix of the disc introduces the portable cello of the British officer Harold Triggs whose ‘holiday cello’ of c.1900 was made by that most eminent firm W.E.Hill and Sons. He took it to the front and because it was made to be easily dismantled and reassembled, it was an instrument that proved popular. 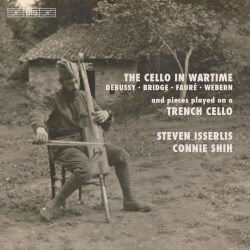 The photograph on the booklet cover in fact shows the French cellist François Gervais playing just such an instrument. Triggs was captured on 21 September 1918 but happily was reunited with the cello many years later. Because of its coffin-like body there are no f-holes but it makes a persuasively functional sound and despite the lack of resonance Isserlis is able to coax some gravely expressive sounds from it. The quartet of pieces he has selected is appropriate and the way he plays them – and is accompanied – is rather moving. BIS’s engineering is excellent and Isserlis’ notes lucid and personal.